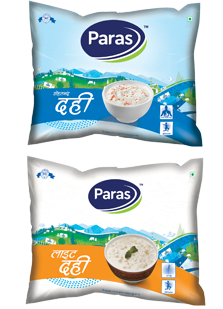 Fresh and natural Paras Dahi is pasteurised and standardized from nearby level milk producers. Pasteurized and standardized in the state-of-the art ISO-9001: 2000 manufacturing plant at Sahibabad. Paras Dahi has all the goodness of toned milk coupled with all essential nutrients. What's more, with the final product made in a hi-tech production atmosphere, its delicious taste also immense therapeutic value. Fresh Dahi - 400 gm & 200 gm, Lite Dahi - 400 gm & 200 gm.